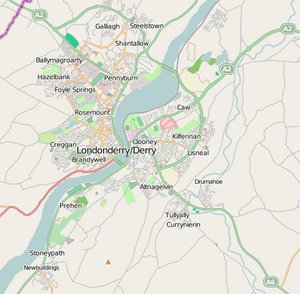 Derry (/ˈdɛrɪ/), officially Londonderry (/ˈlʌndənˌdɛrɪ/), is the second-largest city in Northern Ireland and the fourth-largest city on the island of Ireland. 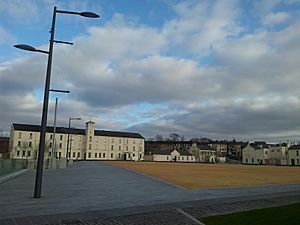 The name Derry is an anglicisation of the Old Irish name Daire (modern Irish: Doire) meaning "oak grove". In 1613, the city was granted a Royal Charter by King James I and gained the "London" prefix to reflect the funding of its construction by the London guilds. 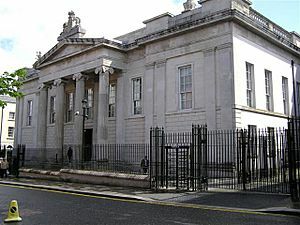 While the city is more usually known colloquially as Derry, Londonderry is also commonly used and remains the legal name. 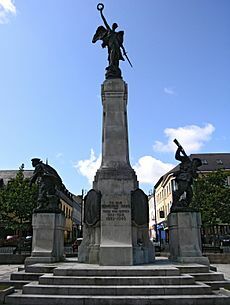 Apart from the name of Derry City Council, the city is usually known as Londonderry in official use within the UK. In the Republic of Ireland, the city and county are almost always referred to as Derry, on maps, in the media and in conversation. In April 2009, however, the Republic of Ireland's Minister for Foreign Affairs, Micheál Martin, announced that Irish passport holders who were born there could record either Derry or Londonderry as their place of birth. 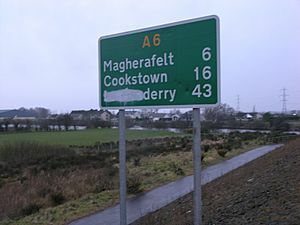 Whereas official road signs in the Republic use the name Derry, those in Northern Ireland bear Londonderry (sometimes abbreviated to "L'Derry"), although some of these have been defaced with the reference to London obscured. Usage varies among local organisations, with both names being used. 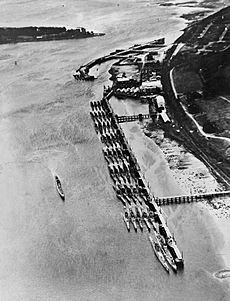 Examples are City of Derry Airport, City of Derry Rugby Club, Derry City FC and the Protestant Apprentice Boys of Derry, as opposed to Londonderry Port, Londonderry YMCA Rugby Club and Londonderry Chamber of Commerce. Most companies within the city choose local area names such as Pennyburn, Rosemount or "Foyle" from the River Foyle to avoid alienating the other community. Londonderry railway station is often referred to as Waterside railway station within the city but is called Derry/Londonderry at other stations. 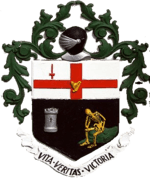 The council changed the name of the local government district covering the city to Derry on 7 May 1984, consequently renaming itself Derry City Council. 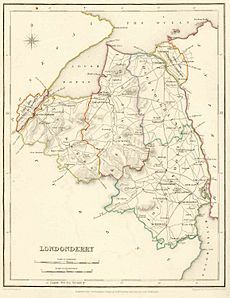 This did not change the name of the city, although the city is coterminous with the district, and in law the city council is also the "Corporation of Londonderry" or, more formally, the "Mayor, Aldermen and Citizens of the City of Londonderry". 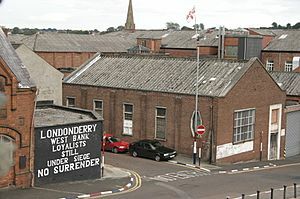 The form "Londonderry" is used for the post town by the Royal Mail, however use of Derry will still ensure delivery. 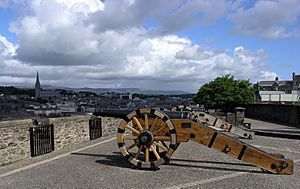 The city is also nicknamed the Maiden City by virtue of the fact that its walls were never breached despite being besieged on three separate occasions in the 17th century, the most notable being the Siege of Derry of 1688-89. 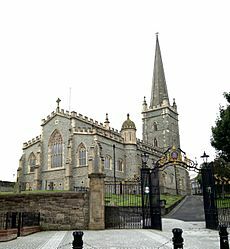 It is also nicknamed Stroke City by local broadcaster, Gerry Anderson, due to the 'politically correct' use of the oblique notation Derry/Londonderry (which appellation has itself been used by BBC Television). A recent addition to the landscape has been the erection of several large stone columns on main roads into the city welcoming drivers, euphemistically, to "the walled city". 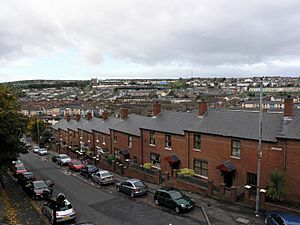 Derry is also a fictional town in Maine, United States, used in some Stephen King novels. The Walls were built in 1613–1619 by The Honourable The Irish Society as defences for early 17th century settlers from England and Scotland. The Walls, which are approximately 1 mile (1.6 km) in circumference and which vary in height and width between 3.7 and 10.7 metres (12 and 35 feet), are completely intact and form a walkway around the inner city. They provide a unique promenade to view the layout of the original town which still preserves its Renaissance style street plan. 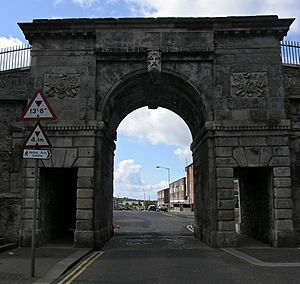 The four original gates to the Walled City are Bishop's Gate, Ferryquay Gate, Butcher Gate and Shipquay Gate. Three further gates were added later, Magazine Gate, Castle Gate and New Gate, making seven gates in total. Historic buildings within the walls include the 1633 Gothic cathedral of St Columb, the Apprentice Boys Memorial Hall and the courthouse. The city has seen a large boost to its economy in the form of tourism over the last few years. away, though poorly connected by public transport. Lonely Planet called Derry the fourth best city in the world to see in 2013. In 2011, on the 25th of June, the Peace Bridge opened. 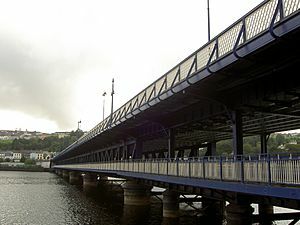 It is a cycle and foot bridge that begins from the Guild Hall in the city centre of Derry City to Ebrington Square and St Columb’s Park on the far side of the River Foyle. 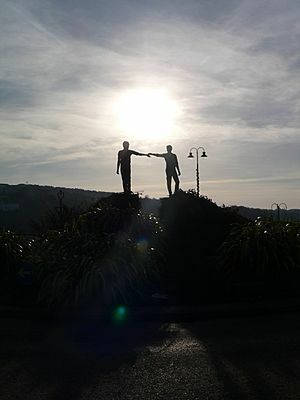 It symbolizes the unity of the Protestant community and the Nationalist community who are settled on either sides of the Foyle River. 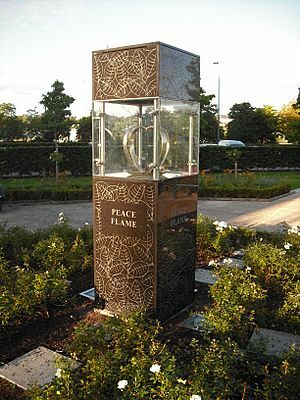 "The Derry Peace Bridge has become an integral part of Derry City’s infrastructure and has changed the way local people use and view their city with over 3 million people having crossed it so far and many of the locals using it daily". The airport is served by Ryanair with scheduled flights to Glasgow Airport and Liverpool, all year round with a summer schedule to Alicante and Faro. The City of Derry Tramways was opened in 1897. This was a standard gauge (1,435 mm (4 ft 8+1⁄2 in)) line served by horse trams and was never electrified. 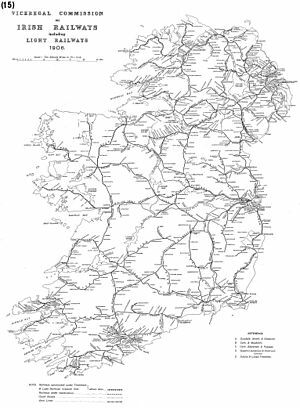 The tramway had only one line, was 1.5 miles (2.4 km) long, and ran along the City side of the Foyle parallel to the LPHC's line on that side of the river. It was closed in 1919. Londonderry Port at Lisahally is the United Kingdom's most westerly port and has capacity for 30,000-ton vessels. The Londonderry Port and Harbour Commissioners (LPHC) announced record turnover, record profits and record tonnage figures for the year ended March 2008. The figures are the result of a significant capital expenditure programme for the period 2000 to 2007 of about £22 million. Tonnage handled by LPHC increased almost 65% between 2000 and 2007, according to the latest annual results. Derry Facts for Kids. Kiddle Encyclopedia.